The only Series II Saoutchik cabriolet ever built. It was shown in the 1954 San Remo Concorso d'Eleganza. After the Civil War, the nationalistic government of Spain was interested to develop its own automotive industry. The State-owned company ENASA (short for Empresa Nacional de Autocamiones SA) incorporated the old factories of the Hispano-Suiza in 1946. ENASA produced trucks, buses and military armored vehicles under the Pegaso and, for a short while, Sava brands. A number of experienced engineers were recruited. The former Alfa Romeo engineer Wifredo Ricart was charged as chief technical manager. Before joining Alfa Romeo in 1936, Ricart had successfully built and raced cars under his own name in Spain. In Alfa Romeo he designed and developed many engines, from aviation to racing cars. There he met Enzo Ferrari, and it seems the two characters did collide somehow. He approached company executives with the idea of launching a Spanish supercar. 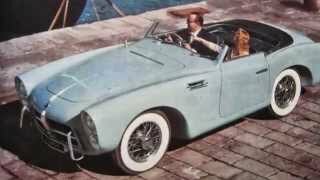 Ricart received the approval of the project and the Pegaso Z-102 exotic sport car was born. The cars were advanced for the time and entered production with a 2.5 (2472cc) litre engine as used in the prototypes, though later there were variants with 2.8 (2816cc), and 3.2 (3178cc) litre DOHC desmodromic 32-valve V8 360 hp (270 kW) engines with multiple carburetors or optional supercharger. Horsepower ranged from 175 to 360, and, transferred through a five-speed gearbox and gear-driven camshaft, the fastest could reach 155 miles per hour (249 km/h), exceeding Ferrari autos, thus making it the world's fastest production car at the time. It was decided that the chassis, drivetrain and engine would all be built in house by Pegaso in Barcelona and then the rolling units would be shipped off to external coachbuilders to have bodies fitted, in the tradition of pre-WWII automakers. The Pegasos raced in several competitions, but with no real success. Pegasos achieved much better results in several Concours d'Elegance. The Pegasos weren't very successful in the marketplace, between 1951 and 1958 just 84 cars were produced, and out of these, only 22 cabriolets were built. Carrozzeria Touring of Milano made a total of 40 including the Thrill concept car. Touring fitted the racing cars with roadster bodies using their light weight 'superleggera' construction. Saoutchik made a total of 18 bodies. Serra of Barcelona built a total of 7 and the balance of 19 were designed and made by the Pegaso works. This Z-102 with chassis number 3-0136 is one of the 18 Pegaso vehicles built at Saoutchik with an aluminum body: 10 of the series I and 8 of the series II. It is the only cabriolet of the II series, which follows three other cabriolets, the first considered a prototype and the other two from the I series. Some historians consider this convertible, actually, a third series but in any case is the only one with this body. This car was built on RHD 3-0136 chassis and shared its lower body style with the series II coupé. The flamboyant styling of the convertible finished in metallic blue has an appealing profile accentuated by the wings slightly extended to the rear, the headlamps accommodated in keyhole-shaped recesses, and the gently curved and ultra-low windscreen. The radiator grille is typical of the marque, the wings forming an elegant wave and the back of the car finishing simply with two taillights. The car was shown in April 1954 in the San Remo Concorso d'Eeleganza, driven by Pierre Saoutchik and his second wife Henriette. In 1956 the car was sold to Luciano Eliakin, Spanish racing driver. The car was qualified but did not race the 3rd edition of the Gran Premio Nacional Sport, organised by the Real Automóvil Club da España at the Circuito del aeropuerto de Barajas. In 1958 Rafael Bernaldo de Quirós y Pardo de Santayana, Count de la Puebla del Maestro (Madrid) converted the cabriolet to a berlinetta by fitting a top. The body has remained original, except for the retrofit of the top. It kept this top until the start of the 1990s when its owner decided to return the car to its original configuration, restoring it to the cabriolet form that it had when new. Later, there have been two other restorations that brought the car to its original condition.